If you are tempted to purchase an e-reader in order to be able to carry around hundreds of books on one smart device, it’s definitely well worth continuing reading in order to discover 3 of the best book technologies which you may be interested in investing in. If you’re looking to purchase a lightweight device, it’s well worth looking into opting for a standard Kindle device which only weighs 161 grams. Whereas the Kindle Paperwhite weighs in at 205 grams, the Kindle Voyage weighs in at 180 grams and the Kindle Oasis weighs in at roughly 194 grams. Which means that a standard Kindle is actually lighter than your average paperback book. What are some of the other reasons why you should consider purchasing a Kindle? If you were to try and use your smartphone to read a book which you’ve downloaded onto your smartphone, you will find it difficult to read in the sunlight. Better yet, Kindle has been designed to be easy on your eyes, so if you read books on your Kindle for several hours straight, your eyes won’t struggle to continue reading. 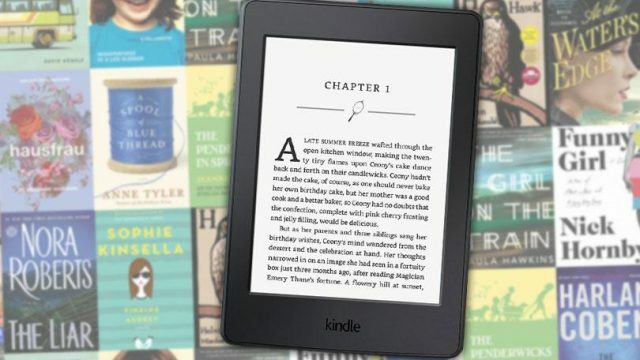 As a standard Kindle also boasts 4GB of storage, you’ll also be able to store all your favorite books on a single device, which is incredibly handy. If you prefer to purchase all of your ebooks through Amazon, it’s definitely worth purchasing an Amazon Kindle, which will allow you to download new books from Amazon over Wifi. Better yet, it will take less than a minute to download a new book. Which means that updating your Kindle library on the go, is a breeze. If you’re not sold on the idea of investing in a Kindle, you may be interested in finding out more information about the Kobo eReader. The Kobo eReader is one of Kindle’s most highly rated competitors and claims to offer an e-reader which offers the clearest digital display on the market. The Kobo Aura ONE is Kobo’s most popular model and a sleek 7.8-inch screen and is a great choice for those of you who like to read late at night as it boasts Comfort Light PRO. A unique feature which features front light technology which decreases eye strain at night. Better yet, if you enjoy reading books outdoors, you’ll love the fact that the Kobo Aura ONE’s screen automatically senses changes in light quality and will automatically change its brightness to suit the natural lighting. So if it gets darker in the afternoon, when you’re sitting outside reading on your Kobo Aura ONE, your device’s screen will naturally start to get brighter, without you having to waste valuable time manually changing your Kobo device’s settings. So if you’ve put off purchase a digital e-reader in the past and are now ready to take the plunge and to purchase your very first e-reader, you simply can’t go wrong opting for a Kobo eReader an Amazon Kindle or a standard Kindle. All of which have stellar reviews from millions of satisfied customers around the world.